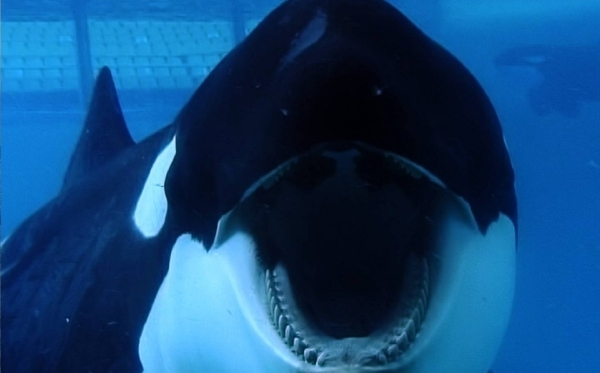 A mesmerising psychological thriller with an enormous captive killer whale at its centre, Dogwoof’s powerful and gripping documentary Blackfish (2013) is the first film since Werner Herzog’s captivating Grizzly Man (2005) to show how nature can get revenge on man when pushed to its furthest limits. To celebrate the DVD release of this critically acclaimed doc/thriller this Monday (26 August), we’ve kindly been provided with THREE DVD copies of the film to give away to our lucky readers, thanks to the Dogwoof team. This is an exclusive competition for our Facebook and Twitter fans, so if you haven’t already, ‘Like’ us at facebook.com/CineVueUK or follow us @CineVue before answering the question below. Blackfish tells the story of Tilikum, a performing orca that killed several people while in captivity. Along the way, director-producer Gabriela Cowperthwaite compiles shocking footage and emotional interviews to explore the creature’s extraordinary nature, the species’ cruel treatment in captivity, the lives and losses of the trainers and the pressures brought to bear by the mulit-billion dollar sea-park industry. This emotionally wrenching, tautly structured story challenges us to consider our relationship to nature and reveals how little we humans have learned from these highly intelligent and enormously sentient fellow mammals. Killer whales belong to which animal order? Gabriela Cowperthwaite’s Blackfish is released on DVD from Monday 26 August, courtesy of Dogwoof. Purchase your copy here. The competition closes at 6pm on Thursday 29 August, 2013.